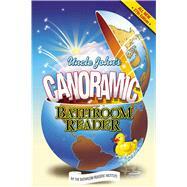 Weighing in at a whopping 544 pages, Uncle John’s Canoramic Bathroom Reader presents a wide-angle view of the world around us. It’s overflowing with everything that BRI fans have come to expect from this bestselling trivia series: fascinating history, silly science, and obscure origins, plus fads, blunders, wordplay, quotes, and a few surprises (such as some of the "creative" methods people have used to pay off their alimony). And yes, Uncle John’s latest masterpiece is guaranteed to keep readers on the edge of the can! So hang on tight and learn about hairy superstitions, animals who act like people, the mother of the Father of Our Country, really BIG things, the world’s first private eye, Bill Gates and his "Toilet Challenge," the story of the Freedom of Information Act, how to behave like a 16th century-style gentleman, the world’s most incredible oil strikes, the Suzette for which Crêpe Suzette is named, and Sewerage Day. Happy Sewerage Day! The Bathroom Readers' Institute is a tight-knit group of loyal and skilled writers, researchers, and editors. The BRI understands the habits of a very special market  Throne Sitters  and devotes itself to providing amazing facts and conversation pieces. They are headquartered in Ashland, OR, and San Diego.